In the Skirmish version of this map, the openness of that area is what makes holding C so crucial, because you can sit back at C and crush anyone trying to cross that space from a distance, giving you a much easier time at defending A as well. In the OMS Ambush, my team got rolled because holding any of the turrets in the area gives you massive dominance. I say its still a lot fairer though, because you CAN sit back at B, where there's a nice Supply Depot, grab yourself a forge gun, and duck out of cover to snipe out those turrets, which I finally did at the end of the match. I figure that in the future, that will become a common tactic, probably right from the getgo. The larger area, and especially the building area at B, makes this a lot fairer, and less of a deathtrap. The open field is still a deathtrap, but now it's an avoidable deathtrap, and even a defendable deathtrap with the turrets. Only played on this map once so far, but fighting around the building in the SE corner was a lot of fun. With the new spawn mechanics it quickly turned into a pair of battle lines with people poking back and forth trying to find weaknesses. The elevation and cover options helped to make that possible. 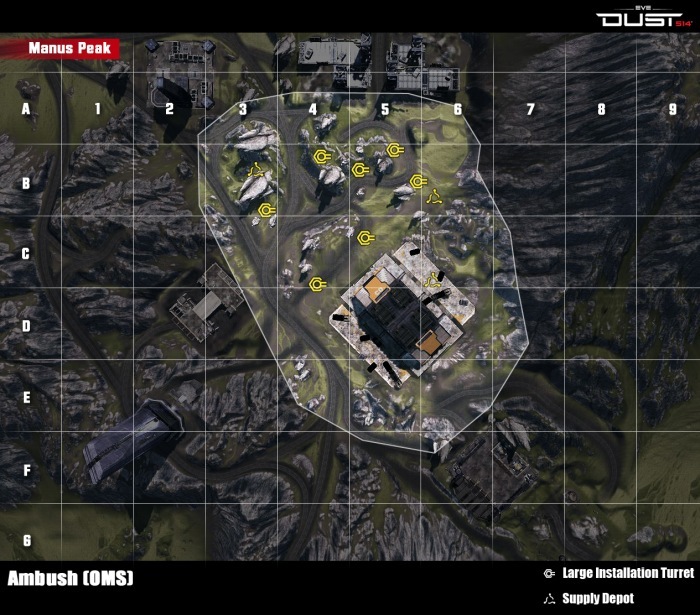 The redzone at the top of the map should be increased to include the rest of those buildings for additional cover and movement. Having roads on the outside of any map means camping HAVs, and when you can't get around the backside to counter them, it means nothing you can do. we should also be able to move into the base at the left of the map where C is on the skirmish map. This would give even more tactical areas besides the circle we have now. Getting stuck in geometry in B3, just walk towards turret from supply depot, in the previous build you could walk straight trough under a rock, now you get stuck, you need to keep jumping until you find a sweet spot to go trough.